VJ Electronix, Inc., the leader in rework technologies and global provider of advanced X-ray inspection and component counting systems, demonstrated a new concept in reel handling automation for component counting. 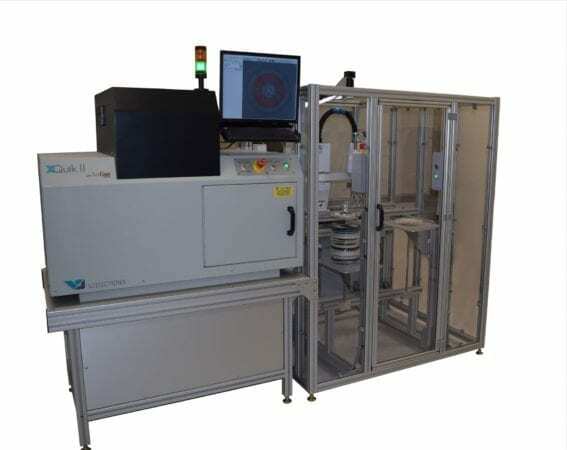 VJ Electronix coupled its leading automatic component counting system with a high-speed, three axis robot to transfer reels from an input storage buffer, into the X-ray counting system, and back to an output storage buffer. The integrated bar code camera reads one or more barcodes at the input buffer, prior to loading. Labels may be applied at the output buffer. Built in VJE’s Chelmsford, MA factory, the robotic reel handling system is a collaborative effort between VJE Chelmsford, VJE Suzhou China, and VJE’s Technology Partner, AccuAssembly. Radiocrafts – Get a Faster Response From Your RF Network!